For a game that has been criticised as lacking in innovation, with new features that don't quite hit the spot, it's remarkable that Assassin's Creed: Revelations represents the biggest leap in rendering technology for the series since the arrival of the first sequel. From a technical perspective, it is clearly the most impressive game of the bunch - the high point from a series that in many ways has been defined by its technology. What is really impressive about Revelations is the developers' intention to make the games' signature cityscapes more natural and realistic: sharp edges are smoothed off with additional polygons and fine detailing, and lighting is more balanced, nuanced and easier on the eye, backed up by beautifully handled atmospheric rendering effects. Mist, fog, rain, heat haze - all are present and add immensely to a revitalised feel in capturing the essence of an ancient city from times gone by. It's not just the environments that have seen immense change: the characters themselves are now significantly richer in detail, with facial and body animation that is much improved over the previous Assassin's Creed games. In fact, they're so far removed from what we've seen before that there's something of a shock when you first see the new-look Ezio and Desmond: they seem to be almost, but not quite, completely unlike the characters we've got to know across several games (yet bizarrely, Altair seems to be fine). In truth, it takes a little while to adjust, especially when the first ten minutes of the game presents us with the old renditions of the characters in a "previously" sequence, full CG alternatives in the full intro, and then the "version 2.0" rendered versions, which look completely different again. Regardless, with all of these new upgrades in place, the question is whether the current-generation hardware can cope with all this new detail. Flash back to our Assassin's Creed 2, and Assassin's Creed: Brotherhood Face-Offs and we see an engine that is already running on the bleeding edge: aiming for 30FPS but in many cases not quite managing, resulting in some often ugly screen-tear - with the PS3 mostly coming off worse in terms of the direct comparison between platforms. Let's take a good hard look at how Revelations looks and plays, with the analysis commencing with a direct head-to-head video, backed up by a 50-strong PS3/360 720p comparison gallery. 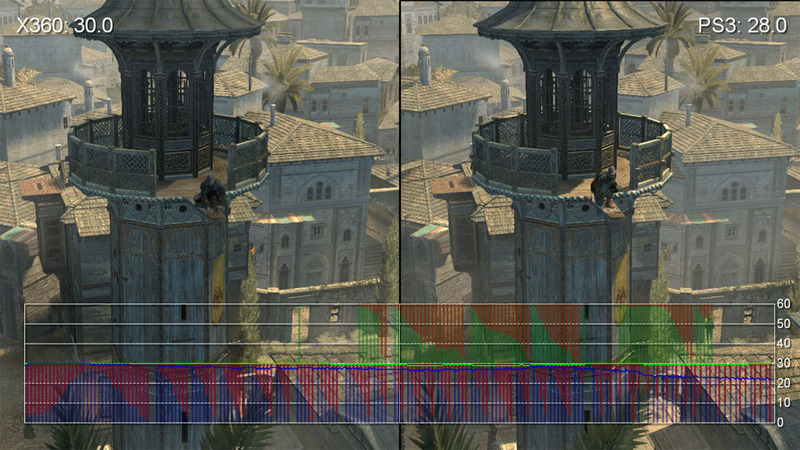 There are few surprises in the basic make-up of the framebuffer: exactly as per previous games in the Assassin's Creed series, we see a native 720p resolution on Xbox 360, with PS3 effectively as good with just a couple of lines of pixels missing from the top of the screen - perhaps a memory saving issue (utilised by DICE and Insomniac amongst others) but one that is unnoticeable during play. In order to free up resources on the Xenos and RSX graphics chips, the hardware anti-aliasing techniques used on previous Assassin's Creed titles have been given the elbow, with Ubisoft Montreal opting for a post-process technique that we can't readily identify, but which seems to be based on the usual system of filtering the final frame as a single object after it has been rendered. It's highly unlikely to be NVIDIA's FXAA as there is absolutely no texture blur that we can discern on either system whatsoever, and it has to be said that the overall level of the presentation here is simply wonderful. In terms of how well the post-process AA fits into the game's aesthetic, we'd say that it's up to the same kind of level as God of War 3 - the game that really put the technique on the map, and remains one of the best examples from a visual quality perspective. Perhaps it's the nature of the more organic, detailed artwork, but the kind of pixel-crawling artifacts we see on many games that employ post-process anti-aliasing are barely noticeable here and instead we are seeing the effect at its best, providing edge-smoothing that is a clear step up in quality from the hardware implementations we saw on previous games with little to no negative elements added to the picture quality. It's a win-win. Post process anti-aliasing in Revelations is amongst the best we've seen, doing a phenomenal job in smoothing off edges and emphasising the more organic look. Sub-pixel artifacting - as seen on the ship rigging here - is kept to a minimum overall. The AA tech seems to be identical on both systems. The good news is that both Xbox 360 and PlayStation 3 versions of Revelations appear to be using the same technique, so the difference we've seen between the consoles in previous Assassin's Creed titles (where quincunx AA blurred the intricate detail on PlayStation 3, yielding a 360 advantage) has now gone. In terms of the rest of the game's visual make-up, we see very little to tell these two releases apart. When it comes to the quality of the artwork, the texture filtering, and implementation of various rendering techniques, the two games are virtually identical to one another. There's the odd, very minor difference in shadowing that only seems to manifest at very close range, but other than that, Ubisoft has done a phenomenal job in making such a rich game look so close on both consoles. The only obvious difference we came across in our playthrough concerned the level of atmospheric haze being rendered - as you can see, it can vary quite dramatically. Sometimes it's thicker and more pervasive on PlayStation 3, in other areas it seems to manifest more thickly on the Xbox 360. It's only really noticeable if you have both versions running side-by-side though and doesn't have any impact on the gameplay experience whatsoever. We saw some differences in the way that atmospheric rendering is handled in each of our playthroughs but there are no significant differences in the image quality overall. While some aspects of the Assassin's Creed graphical experience have been improved far beyond expectations, others remain the same. As you play through Revelations, it's difficult to ignore the levels of screen-tear that can manifest at any given moment - it's by far the most intrusive artifact of the visual presentation. This won't be any kind of surprise to stalwarts of the series: the highly detailed open world, long view distances and wealth of NPCs in Ubisoft's Scimitar/Anvil engine have always pushed up really tightly against the 33.33ms rendering time allocated per frame. However, there's an undoubted feeling that the new visual enhancements in Revelations have come at the cost of more screen-tear and a generally lower frame-rate than what we saw in Assassin's Creed: Brotherhood. We decided to put it to the test with our usual analysis techniques. To begin with, we captured identical engine-driven scenes from the game to get an idea of how the enhanced Revelations engine would cope on both platforms when rendering almost identical scenes. After that the tests would shift to pure gameplay, where we would take scenes captured from the same area in the game and compare them. While these would not be 100 per cent like-for-like, when viewed as a whole it allows us to draw general conclusions on well the game runs on each console. In terms of the basics, there are few surprises here. Since Assassin's Creed 2, both consoles have run the games with a capped 30 frames per second update. When rendering load exceeds the 33.33ms rendering budget, v-sync is dropped and the framebuffer is updated as soon as the new image is ready, during the refresh period - thus causing screen tear. If the game engine continues to struggle, the tear moves lower and lower until a dropped frame is registered, while an improved rendering time will see the tear move back up the screen until v-sync kicks back in again. 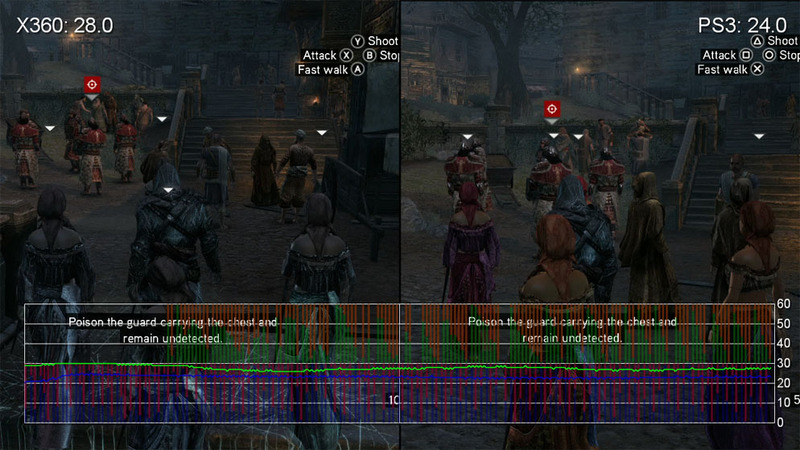 As with Assassin's Creed: Brotherhood, what we see in this series of like-for-like scenes indicates that while the Xbox 360 game seems to be able to maintain its frame-rate with more consistency, there are clearly certain scenes where the PlayStation 3 manages to run with less screen-tear and a higher level of performance. It suggests that the Scimitar engine has been optimised for both consoles, presenting rendering scenarios that - although mostly similar - can favour one platform over the other. However, in previous titles, we've always recommended the Xbox 360 version of the game with very little hesitation. Testing of pure gameplay generally seems to return a clear performance advantage for the Microsoft console, and it's safe to say that the situation hasn't changed that much at all with Revelations. Once again we do see that the PlayStation 3 version of Revelations appears to have its own performance advantages in certain scenes, but generally speaking, scenes that push the city-rendering engine generally hold up better on the Xbox 360. We found that the deeper we moved into the various districts of Constantinople, the more areas we discovered that really didn't perform that well on the PlayStation 3, with lots of dropped frames and far more visible screen-tear. While the issues aren't anywhere near as pronounced as the series' PS3 performance nadir in the first Assassin's Creed, the overall impact is noticeable and has a clear impact on gameplay. Control has always felt a little unresponsive on all of the Assassin's Creed games, with some obvious input lag, but when performance drops with frame-rate at the mid-20s, Revelations is a lot less fun than it should be. Some areas are absolutely fine, others are impacted significantly, but the fact is that the Xbox 360 version just feels more consistent overall. Elsewhere, Assassin's Creed: Revelations is interesting in that it's the first game in the series to support 3DTVs. Bearing in mind the performance difficulties the series has traditionally faced, the notion of generating two independent views sounds like a recipe for disaster. However, the good news is that the impact is limited: indeed, this may well be the most fully supported rendition of 3D we've seen. Both games support HDMI 1.4 frame-packing, meaning that the consoles are outputting a 1280x1470 framebuffer, containing two 720p images (one per eye) along with 30 lines of "blanking" information that help tell your 3DTV where each image ends and the next begins. Not exactly news for PlayStation 3 owners, but this is only the second Xbox 360 game after Batman: Arkham City to support the standard 3DTV format. 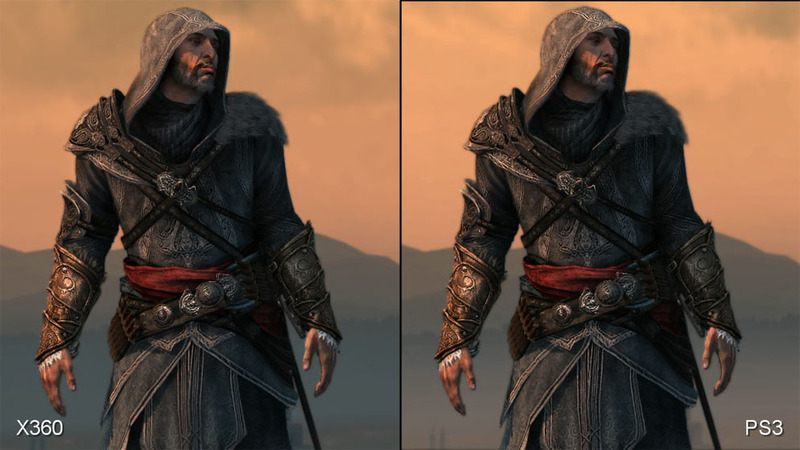 Assassin's Creed: Revelations also supports Inficolor anaglyph-style glasses, along with side-by-side 3D modes if an HDMI 1.4 compliant screen is not detected. In short, whatever kind of 3D display you have - even if it's an old one - you should be able to play with stereoscopy engaged. The TriOviz implementation seems to see a reduction of resolution to 1024x720 along with some minor environmental compromises. We weren't hugely impressed with the blurred presentation on the Xbox 360 version. We played both titles in 3D and found that the the overall experience was there and the level of immersion was fairly subtle but quite effective. Just like Gears of War 3 and Batman: Arkham City, it is Darkworks' TriOviz 3D system that is being used here. The idea here is that only one view is generated, saving on precious system resources - clever code from Darkworks then utilises the depth data the consoles use when rendering the scene to extrapolate out how the game should look to each eye. However, we couldn't help but notice that resolution had dropped from native 720p to 1024x720, and environmental detail seemed to be cut back in places. So why the resolution and detail drop? Our best theory is that the new TriOviz overcomes its previous issues in terms of reprojection artifacts and alpha sorting with additional processing that requires more GPU time. In common with Batman: Arkham City, frame-rate is unlocked and there's a lot of tearing, but it's quite interesting that as the two views are basically blended, a lot of the tearing passes by unnoticed (GT5 uses the same trick). The only issue we had with the TriOviz presentation was something we noticed when we took a look at Batman: Arkham City. In its HDMI 1.4 guise, TriOviz on Xbox 360 seems to retain native resolution but has a blur that impacts overall image quality. Overall though, we'd say that the 3D effect works well here and it's a good addition to the game. TriOviz seems to be three for three on quality games in the wake of Gears 3 and Batman. The visual upgrades are really impressive and despite the performance impact, it's difficult to fault the scale of the technical achievement here: the core upgrades to the Assassin's Creed engine are all exceptionally impressive. But it is a shame that the technological improvements are not reflected by much in the way of innovation in the gameplay. Variety in the cityscapes feels more limited compared to previous games, while new gameplay elements such as the tower defence sub-game seem highly incongruous with the basic idea of what Assassin's Creed is all about. It's difficult to raise much enthusiasm for aspects such as this and the bomb-making component, when core elements such as the social stealth implementation remain under-developed or outright bizarre (hiding in the middle of a bunch of Romany dancing girls in order to fire off poison darts at Templars is something of a "WTF" moment - you can see towards the end of the gameplay performance analysis video). But make no mistake - this is still a fully featured Assassin's Creed title with a lot of gameplay to enjoy, so which console version gets the nod? Well, in visual terms the gap has narrowed once more to the point where image quality comparisons are basically pointless, but things are certainly different from a performance perspective. Here, across the run of play, it's clear that the Xbox 360 version has a consistency in terms of frame-rate and controller response that seems to be lacking within certain map areas on the PlayStation 3. That said, the PS3 version does have an interesting bonus of its own - and an intriguing take on how to make use of the colossal amounts of Blu-ray storage. The game uses a touch under 16GB of the available 25GB storage, but 7.6GB of that is actually the original Assassin's Creed, reformatted into a PSN-style package that installs directly onto the hard drive. In truth, this is the least compelling chapter of the saga, and it has to be said that it's really disappointing compared to the Xbox 360 version - but hey, it's a freebie. What's not to like about that? Only 35 per cent in 15th century Spain. For PC, PS3 and Xbox 360. UPDATE: Ubisoft confirms. 100 hours of content included.